We released new version of ImageMontage free visualization tool (ImageMontage v.2). ImagePlot v.2 download (please use this version, rather than the one on ImageJ website). - Create high resolution montages of large image collections. For example, you can visualize a collection of 40,000 images (assume each image is 100 x 100 pixels) in a single 20,000 x 20,000 pixel montage. - The images can have different sizes and/or proportions - they will be scaled to the same height in the montage. - The new version allows you to create 1-level, 2-level, or 3-level montages. For example, you can organize your photos by year, month, and event. Or, you can montage images of van Gogh painting by city, year, and season. (See examples below). ImageMontage is a plugin for ImageJ, a popular free open source image analysis software (runs on Mac, PC, Lunix). 3) In ImageJ: use File > Open to open the plugin file. Then click on: Macros > Run. ImageMontage will start. Check our ImagePlot and ImageSlice visualization plugins for ImageJ. A montage of selected van Gogh paintings organized by creation year (1-level montage). 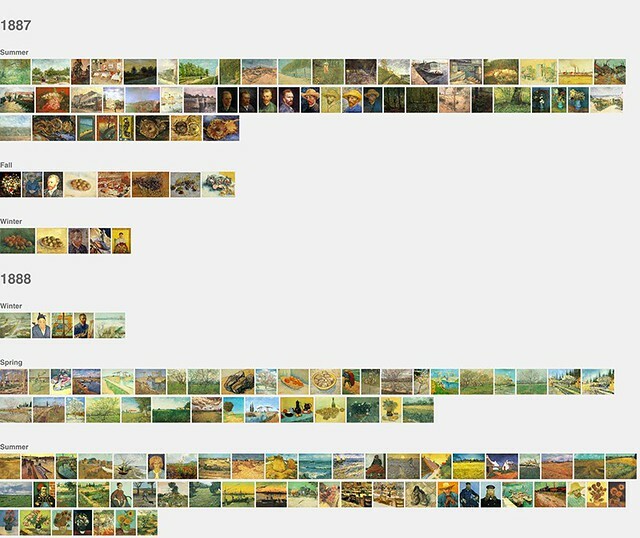 A montage of selected van Gogh paintings organized by creation year and season (2-level montage). Full image (24000 pixels wide) scaled to 640 pixels. See / download 8000 pixel wide version from Flickr. 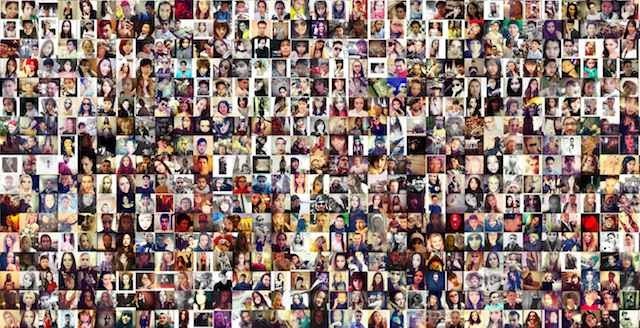 Montage visualization of 33,292 photos shared on Instagram in Tel Aviv during the same period, sorted by upload date (top to bottom, left to right). Montage visualization of 55,498 Instagram photos from Tokyo uploaded during four consecutive days, sorted by upload date and time (top to bottom, left to right). Montage visualization of 57,493 Instagram photos from New York uploaded during four consecutive days, sorted by upload date and time (top to bottom, left to right).